I have to admit, I went into this book with a little bit of apprehension because I wasn't sure I was ready for yet another book about supernatural teen werewolves, but I was so wrong. Haven definitely has some typical YA tropes, but it also is incredibly different than other fantasy novels. The first thing I really loved was that the book was told in third person from the perspective of Rain Ryland, a young man with a tough upbringing. I liked that it was told from Rain's perspective because it was a little refreshing to hear from a male. The romance had a different feel to it and the action scenes had a little extra flair coming from a male's point of view. Not that I don't love a female's perspective, it was just nice to have a different view. I also loved that there was a little mystery involved in the supernatural powers of the weavers. The reader was only given little bits of information as the story went on. It was like we were learning about the supernatural world along with Rain. It made the novel have a really nice pace and it felt like the story was unfolding more and more with each turn of the page. There were many impressive characters, but I think Freddie was my favorite. She had an alpha attitude and she didn't take crap from anyone... I loved her! 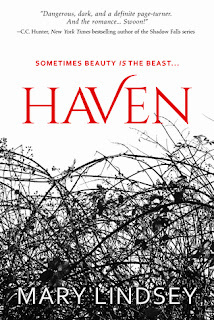 I typically don't like to dig too deeply into the plot because I don't want to spoil anything for those who have yet to read the novel, but I will say Haven is definitely a read I would encourage people to pick up! It is filled with action, romance, werewolves and constant entertainment that will leave you wondering who is good and who is evil. Thank you to NetGalley and Entangled Teen for sending a copy in exchange for an honest review.